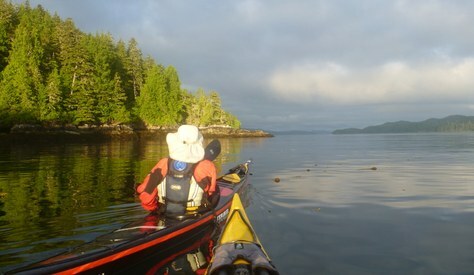 This summer, a group of Mountaineers sea kayakers will set-out for a three-week trip down the west coast of Vancouver Island. Learn about the communication and emergency signalling devices we are carrying on our trip, and how we plan to use them. On June 24, I will be leaving home - along with a group of three other Mountaineers sea kayakers - to paddle down the west coast of Vancouver Island. Our plan is to take three weeks, starting in Winter Harbor and ending in Tofino, paddling a distance of over 200 nautical miles of exposed and remote outer coastline. As a part of our safety plan, we've included electronic signaling devices which we can use to call for emergency help. This blog describes the various options that I considered for our trip, an overview of what we decided to bring, and how we will use these devices throughout our journey. I won’t go into details about how each device works, as a more comprehensive description of these emergency communication devices appears in a previous blog post about signalling for help by satellite. I’ve been doing wilderness trips for 40 years. Over the years, I’ve seen new communication options become available and have owned and carried many of them. On my early water trips, I carried a marine radio and an EPIRB (predecessor to the PLB). I have owned SPOT devices starting from their very first model. And, like most, I have a cell phone. My decisions for this particular trip are based on these experiences. This is a water trip, so we are carrying portable marine radios. These provide two way communication with coast guard and other boaters. Calling the coast guard over marine radio will be our primary method to call assistance. In 2012, I called the coast guard on behalf of another party who had a member experiencing a medical problem. The coast guard coordinated his transport by private boat to a local clinic, and within three hours of initial contact, he was in a hospital in Vancouver. Two-way communication with rescue services is tremendously valuable. You can describe your exact situation and location, you can coordinate the right level of assistance, and you have peace of mind that assistance is on its way. Marine radios are so valuable that each member of the group will have one, and we can carry them in a pocket in our PFD. For land trips, there is no equivalent to these radios. Because most of my trips have been on water, I’ve not had to make a decision about what to purchase. But, I’ve always been thinking about it, both as a backup for water trips and as a primary communication device for land-based trips. Most people have cell phones. These are good to carry, but it is easy to get out of cell phone range. On a day hike in the Cascades, it is possible to get more remote from rescue than I will be on this coastal trip. Still, I always carry my cell phone. I may be in cell range or I can hike to cell coverage faster than I can hike to a pay phone. We will have cell phones on this trip, but we are mainly using them to read books. We might pick-up service as we pass by some villages, but we are not expecting reliable service from these devices. For an electronic signaling device, the first options to consider is a Personal Locator Beacon (PLB). These are designed to call for help in an emergency and they are the least expensive option. Rescue will very likely come, but communication is only one way, so you don’t know when or in what form. All you can do with PLB is call for full emergency rescue. These are excellent safety communication devices, but there are other options that make the decision less clear. I’ve not yet purchased one of these. The next option is a SPOT, which is a “Satellite Emergency Notification Device” (SEND). These devices communicate through satellite so their coverage area is vast, but not global. There are three problems with the SPOT. First, they are send-only, so you don’t know when or if rescue is coming. They are also lower power than a PLB, so there is a greater chance your message did not get out for help. Most problematic, however, is that the devices are unreliable. I have had multiple units fail on me. One failed in the middle of a paddle trip, causing some concern for everyone tracking our progress. Another failed in such a way that it reported having sent the message, but it actually had not. If you think about it, you will understand that this is the worst possible way for a signaling device to fail. A year ago, a friend bought a SPOT for a hiking trip. Fortunately, he left enough time for testing because the first device did not work. I will not buy or rely on SPOT devices. For years I have kept my eye on the Garmin InReach devices. These are TWO-WAY satellite communicators, which is a big step up in functionality. You can send pre-set messages, but you can also send and receive short text messages. This allows you to communicate with rescue services to detail your situation and get confirmation that assistance is coming. Further, InReach devices are more powerful than other devices, and they use (I am told) a more reliable satellite network. InReach is costly. The devices cost $350 to $450 for a unit, and on top of that, there is a service fee which may be $240 per year or more. I’ve held off buying one because of the cost and because we already have a reliable way to call for help on the water - our marine radios. Even more expensive than the InReach are satellite phones. I’m told prices have come down and that you can also rent equipment. Voice communication is beneficial in that it allows you to exchange a lot of information in a short time. If you can spread the cost of a satellite phone over enough people, or if your trip logistics require more communications, they might be the right option. For us, they are out of scope. So what are we bringing? This year's trip member Charlie Michel made our decision for us by purchasing an InReach Mini. This is a new device, in smaller form factor that past devices. This is what I would choose, were I buying one myself. Why not one of the larger units that include GPS functionality? I don’t want to use my emergency communication device for daily navigation. That puts it at risk of damage, loss, or draining the battery. I prefer to reserve the emergency devices for emergency. Well, for one, it is a backup system to call for rescue in an emergency. If we are unable to call the coast guard with our marine radios, we will activate the SOS function on the InReach. This goes to a private rescue coordination service which will communicate with us to arrange rescue. Because the InReach can send custom messages, we can also request non-emergency assistance. One possibility we anticipate is that we are unable to continue the trip for some reason. We may be safe, in a secure camp with plenty of food, but unable to continue. We can use the InReach to arrange for pickup by private water taxi. This is better than calling full search and rescue for something like a damaged boat or sore shoulders. InReach also allows for personal communication. Garmin provides a service where we can create a web page with a map that shows our track, check-in messages, and any custom messages we post. Our friends can all follow our progress. This will be of interest to our friends and to people who know what the coast is like. Everyone can follow us. We plan to send pre-set messages periodically through the day. We will send “check-in” messages when we start moving and at significant landmarks, and we will send “at-camp” messages when we reach camp. These will be posted on the web page and sent via e-mail or text message to friends who have asked to be updated. The InReach will also send track updates every 30 minutes and these will appear on the map. Occasionally, we may send a custom message to the map to describe something of interest. Finally, we can communicate with friends and family at home. This is personal decision. I plan to exchange brief messages with my partner most days. Introduction of new communication technologies into the back country has always come with debate about how it should be used. When cell phones arrived, people debated those. Some didn’t want them to intrude. Some even suggested that easy ability to call for rescue diminished the experience of remoteness and self-reliance, and that cell phones should not be carried on trips into the wilderness. On a little consideration, I concluded that were there any serious injury, I would be very happy to have any method to call for assistance as quickly as possible. For me, there is no doubt that the ability to call for rescue is a good thing. The ability to update people with your location is, I think, a general good. It adds to safety, and it adds to people’s peace of mind. We are going to an interesting place, and I know that some of my friends will enjoy following our progress. The ability to communicate with people outside of the trip is more mixed. Ultimately, I think this is a personal decision as to what is right for you. I value taking a break from my life and doing something completely different. I value how a group on a long trip becomes a small community. Communication with the outside world breaks that wall. How big do you want that break to be? What do you want to push through it? I’ve suggested to each of the trip members that they consider what news from home they want to hear and what they do not want to hear. The world is changing, and remoteness is slowly leaving the planet. I invite everyone to follow our trip and think about how they may use new communication devices on their future trips. I hope this article and the ability to follow along provides some useful observations.